What is Utelite Lightweight Aggregate? Utelite expanded shale (ES) lightweight aggregates are produced at our facility 36 miles east of Salt Lake City, Utah. We deliver materials to the Western United States, Western Canada, Alaska and Hawaii. Expanded shale lightweight aggregates offer exceptional performance and value in a world of applications. Designers and specifiers for years have benefited from the flexibility in design and cost effective solutions ESLA provides. As our world moves towards a more sustainable approach to all types of construction design, ESLA will, as always, be an integral partner to our societial needs. The shale is of the Frontier Formation, formed during the Cretaceous period. The raw shale is quarried, crushed and screened to our “feed” size. This feed material is stored in raw feed silos and fed into rotary kilns, similar to the type used in the Portland cement industry. 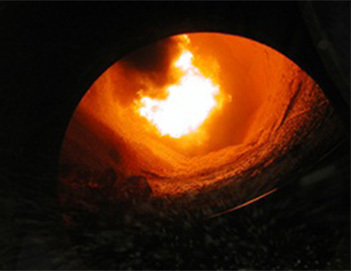 As the raw shale passes down the length of the kiln, the material is heated to a temperature of approximately 2000 degrees Fahrenheit. At this temperature, the shale is red hot and somewhat plastic. Internal gases trying to escape the shale expand or “bloat” the particles, creating a myriad of small non-interconnecting internal voids. These voids are retained after the material cools and solidifies. The extreme firing temperature also vitrifies the shale, much as clay vitrifies into ceramic pottery, creating a hard ceramic shell. These attributes account for the materials lightweight, high strength, acoustic, insulative and fire resistant qualities. The aggregate particle is a uniform, high-quality product that is stable, durable and inert. The finished material is then graded to meet industry or customer specifications. If you have any questions feel free to contact us as we would be happy to answer your questions. If you are outside of our area, be assured that there is a network of producer/suppliers of expanded shale, clay and slate (ESCS) aggregates that are willing and able to assist you with your project.